More than five million people in the UK have signed a petition calling on the government to stop Brexit by revoking Article 50. It's the most popular petition to ever have been submitted on the UK Parliament's website - and historians say it is the biggest ever petition to parliament in history. But the government has ruled out cancelling Brexit, and rejected a previous petition for a second referendum. MP Andrea Leadsom, leader of the House of Commons, has dismissed the petition, saying it has far fewer signatories than the 17.4 million people who voted to leave the EU during the 2016 referendum. So do petitions ever achieve anything - and is there any point in signing one? "Petitions by themselves don't do anything, but they can be a very valuable tool for change," says Cristina Leston-Bandeira, a professor of politics at the University of Leeds, who specialises in petitions and public engagement. It all comes down to "how campaigners use the petition to put pressure on their representatives". The petitions website Change.org says that, globally, one of its petitions secures a campaign victory ever hour. One of the campaigns it lists as a success is the 2015 petition to scrap the "tampon tax" - a sales tax on sanitary products - in the UK. The organiser, Laura Coryton, was a student when she started the petition - and made headlines after more than 320,000 people signed up. Months later, the government said it would try to change the relevant EU law so the tax could be removed. Many retailers also cut costs on sanitary products to shoulder the cost of the tax themselves. Ms Coryton says she did not expect her petition to be so popular, but believes it was helpful in allowing large numbers of people to document their desire for change. "320,000 signatures is much harder to ignore than one person writing to their MP," she told the BBC. However, she's keen to stress while the petition helped attract attention, there were many more factors behind the campaign's success. "So many people wrote to their MPs, started localised campaigns, or raised motions at their universities - it was definitely a combination of traditional campaigning methods and petitions at the same time." Another reason petitions can work is by raising awareness, says Bettina Siegel, a US blogger who led three petitions given "confirmed victory" status by Change.org. Ms Siegel is known for her campaign to stop the use of "pink slime" (lean beef trimmings made from fatty beef carcass off-cuts) in US school lunches, and also petitioned to block a McDonald's infomercial from local schools. "In general, I think a petition can attract the attention of news media because it's a very tangible indication of public interest," she told the BBC. However, she adds: "A business is likely to be more responsive because they have a direct financial interest in pleasing their customers. I think it's more complicated when you're petitioning a government." Why do people sign petitions that are unlikely to succeed? 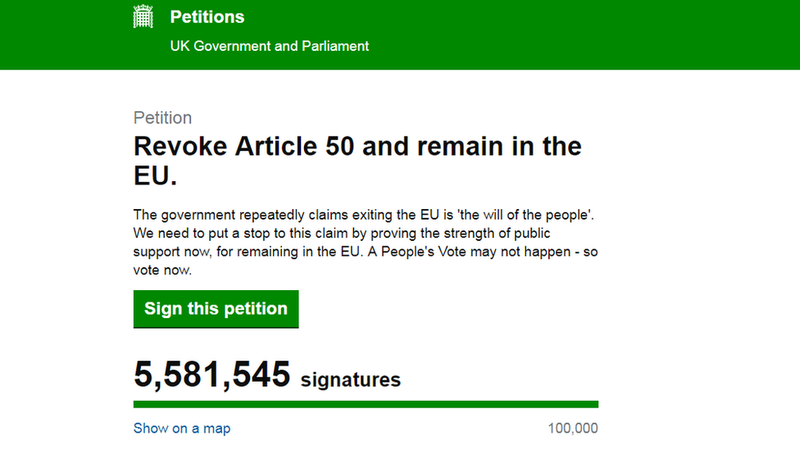 It's fair to say that not all of the 5.6 million people behind the "Revoke Article 50" petition expect the government will suddenly agree to keep the UK in the EU. But, people signing petitions for causes they think are unlikely to win is nothing new. "A traditional historical feature of petitions is that many people will sign it without an expectation that it is necessarily something the government will turn around and agree to" right away, says Dr Richard Huzzey, a historian at Durham University leading a study into petitions. Instead, many signed petitions "out of a sense of duty and self-expression" and to "discharge their own personal sense of responsibility". They "hope it will draw attention [to the issue] and play a part in shifting the dynamic", he says. He points to a 1783 petition against slavery in the colonies - which was not abolished until 1833 - as an example of a petition that supporters would have signed without expecting any immediate change. "Thinking about petitions in isolation misses the fact that historically they've been the lynchpin of broader activism and campaigns - they are very important but rarely a solution in their own right." What makes a modern petition successful? Both Ms Coryton and Ms Siegel believe that petitions work best when they are specific and asking for something "realistically achievable". For example, "ending sexism" is a great goal but too vague, whereas targeting the tampon tax addresses "a specific symptom of a sexist society", says Ms Coryton. Prof Leston-Bandeira argues that petitions don't have to dominate headlines, or attract millions of signatures, to be successful. "If you have a system where petitions are integrated into policy processes, like parliamentary procedures or debate... they can really effect change." She points to the example of a petition into funding for brain tumour research, which sparked a petitions committee inquiry at a point when it only had about 14,000 signatures. Eventually it attracted 120,000 signatures, enabled the stories of many affected by brain tumours to be heard in parliament, and did lead to increased funding. Another petition, to give police dogs and horses more legal protections if they are attacked on duty, received 128,000 signatures. It was debated in parliament, and legislation, known as Finn's law, has now been approved in the House of Commons. Prof Leston-Bandeira says petitions can be divided into "substantive" petitions - that tend to relate to specific policies to be changed, and "protest" petitions, which are more of an reaction or expression of dissatisfaction. "Petitions on specific issues, that are non-partisan, are most likely to be successful," she says, especially if it raises an issue that lawmakers haven't thought about before. However, "protest" petitions can also be effective in less obvious ways. In 2017, more than 1.6 million people signed a petition calling for US President Donald Trump's state visit to the UK to be cancelled, and while Mr Trump still visited the UK, "it took a long time for him to come to the UK, and it was a much more low key type of visit than it would have been when it was first announced", she says. What does all this mean for the 'Revoke Article 50' petition? "The issue with this is it's very divisive - I wouldn't be surprised if there's a counter petition developing as we speak," says Prof Leston-Bandeira. However, she believes the petition is still "likely to apply pressure" and "shape the discourse" with the government. "It will not achieve the revoking of Article 50 by itself, but it's another indicator, like the mass protest on Saturday, that MPs and the government will take into account." Even if millions more sign the petition, however, "it's not the same as people going to vote", given that all UK residents are able to sign the petition whether they are eligible to vote or not. Petitions are not a new thing - in fact there were one million petitions submitted to the UK's parliament between 1780 and 1918. Historians have suggested the first documented petitions were from slaves building pyramids in ancient Egypt, who tried to petition for better working conditions. Until this week, the biggest recorded petition to parliament was a petition against ambulance service cuts, in 1990, that attracted 4.5m signatures.